BluffTitler can render fonts and languages from all around the universe! In the Change font dialog you set the font of the active layer. What does this dialog set? How can I display this dialog? When the All layers checkbox on the tool window is marked, the font properties of all layers of the same layer type as the active layer are set. When you hold down the <Control> key when clicking on the OK button, only the fonts properties of the other layers are set that are changed in the active layer. BluffTitler supports vector and bitmap fonts. Click on the Select vector font... button or open the font family dropdown to select a vector font. After installing a new font, restart BluffTitler to make the new font visible in the dropdown. Click on the Select colour font... button to select a colour font. Use the Picture/ExtrudePicture effect to extrude the font. 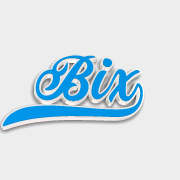 Colour fonts are BluffTitler specific and can be created and converted from various formats with Alphabix. This example uses the Playbox font. Some fonts offer different styles, like Normal, Bold and Italic. Use the style dropdown to select the style. Type professionals call a font family a typeface and a typeface in a particular style a font. For example, "Arial" is a typeface and "Arial bold italic" a font. Most modern fonts are Unicode. If this does not work, try Default. Avoid all the others. Metric kerning uses the kerning info from the font file. This works best for most fonts. Optical kerning computes the kerning from the shape of the glyphs. The amount of kerning can be set with the Kerning property of the text layer. Use Right to left (RTL) for Arabic, Farsi and Hebrew texts. Use Left to right (LTR) for all others. In a well designed font, all number glyphs (0123456789) have the same width. This prevents jumping when animating the numbers. Mark the Normalize numerals checkbox to fix badly designed fonts. 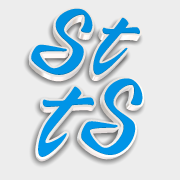 Test this by using the time and counter tags. Some fonts render 2 characters placed right after each other as a single glyph. 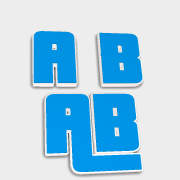 In this example of the Pricedown Bl font, the letters A and B are rendered by a special AB glyph. Some fonts use special characters to create tails. The Painter font in this example uses the < character for a short tail and > for a long one. Some fonts feature more than 1 glyph of the same character. In this example of the Airways font, the letter t has 2 versions. Some characters have accents (diacritical marks). The technical implementation can be very different. 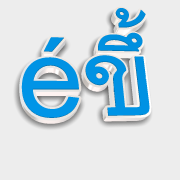 In this example, the é is a single glyph with its own Unicode value. The Thai character however is built out of 3 glyphs that are rendered on top of each other by using clever kerning values. Not all fonts feature all characters. If a not supported character is entered, BluffTitler does not try to find a replacement font (as Windows does), but instead renders nothing. This prevents shows from looking different on different machines because replacement fonts can be different. To fix invisible characters, choose another font family or character set (try Unicode or Default). In some fonts the characters are rotated 90°. This can be corrected by setting the Character rotation property of the text layer to (0,0,-90). BluffTitler fully supports emoji characters in the text and scroller layers. All skin colours are supported, including alien green! Emoji characters always use the same font, as set in the SETTINGS > Options... dialog. The default font is Segoe UI Emoji that comes with Windows. 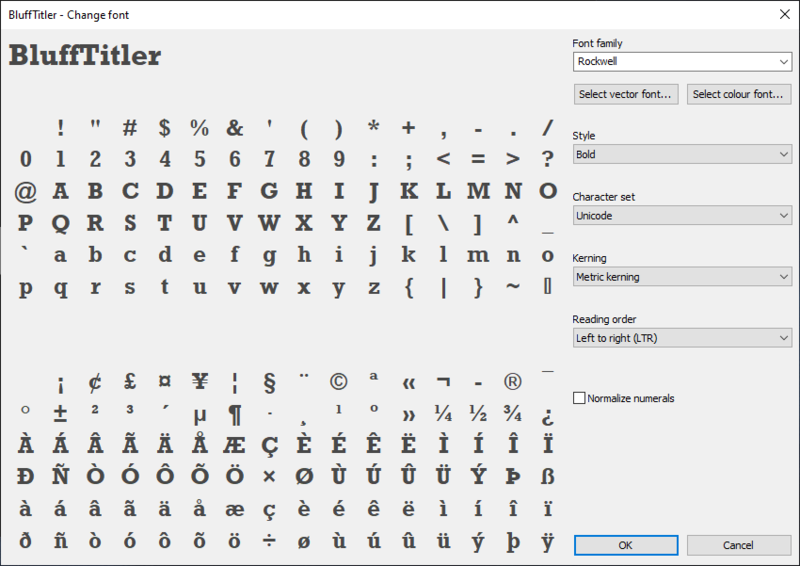 Alternative fonts include Segoe UI Symbol and EmojiOne. The emoji characters can be mixed with other fonts in the same text layer, but make sure to use the Unicode or Default character set. To make it possible to mix emoji characters with texts that use reflectionmapping or other effects, the emoji characters ignore the layer effect unless all characters are emoji characters or if the 1st texture is a colourmap. The size and position of the emoji characters can be set with the Emoji property of the text and scroller layers. Entering Emoji characters works best in the MEDIA > Change text... dialog. Left click on an emoji to add it to your text. Right click on an emoji to replace it with your own picture. The Windows 10 touch keyboard: right click on the system tray and mark the Show touch keyboard button menu item. 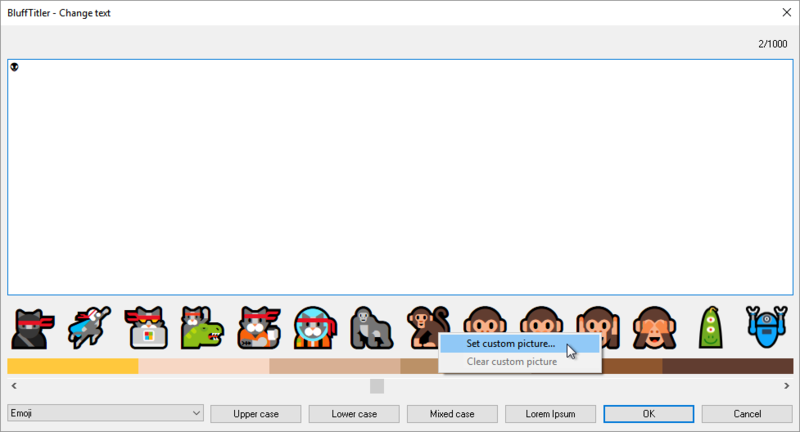 The Windows 10 emoji picker: press the Windows key and . or ; at the same time. Copy pasting them from websites like getemoji.com. Emoji rendering requires Windows 10. Emoji 11.0 is supported if the Windows October 2018 Update has been installed.